Independent Media is one of South Africa’s leading multi-platform content companies. Independent Online, popularly known as IOL, is Independent’s digital offering. With a growing daily unique audience, iol.co.za is one of the largest news and information websites in South Africa. IOL Motoring, a division of IOL, brings car enthusiasts in South Africa the latest in motoring news, car reviews and test drives. It ensures its readers are armed with all the facts, stats and specs needed to make an educated decision when buying a vehicle. IOL were looking to bolster this content with a marketplace, so that users could be provided the environment and tools for every step of the buying process... all within the IOL portfolio. After being convinced of Fiare's expertise in content-driven marketplace sites and their experience in the automotive market, the collaboration could begin. The marketplace would need to fit the brand, keep user safety against ad fraud as a priority and provide a seamless user experience. The result is Drive360. Drive360 offers a safe way to browse and purchase new and used models of cars, bikes and trucks to budget-conscious South Africans. Users can find the most popular brands from top rated dealers across the country. The digital platform is designed to minimise the risk of online fraud so that customers can buy with confidence. The ad posting process does not allow public listings, by partnering only with reputable and vetting each ad by IOLs own agents, Drive360 brings its customers only legitimate deals. Independent Media is one of South Africa’s leading multi-platform content companies. Their stable of publications include 20 of the country’s most prominent newspapers firmly entrenched in millions of households throughout South Africa. Independent Online, popularly known as IOL, is Independent’s digital offering, and brings millions of readers breaking news as events happen in the country and around the world. With a growing daily unique online audience, iol.co.za is one of the largest news and information websites in South Africa. 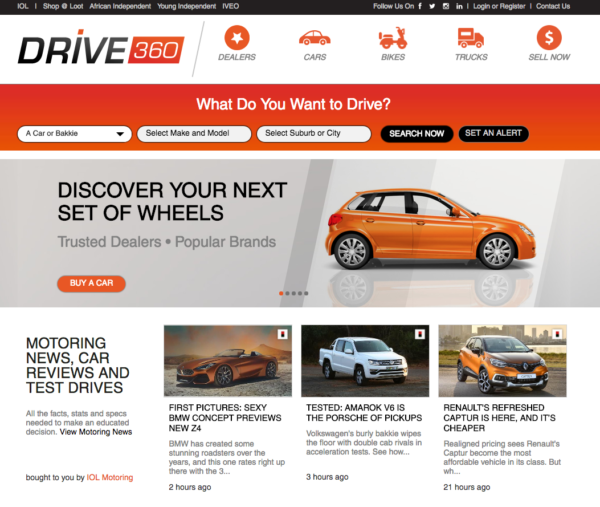 IOL Motoring brings buyers the latest in motoring news, car reviews and test drives. We make sure that they’re armed with all the facts, stats and specs needed to make an educated decision. Backed by Star Motoring, Drive Times and IOL Motoring, the team has 47 years of experience in the motor trade.